Large Event Generator for Multiple units. MUST CALL TO RESERVE!! 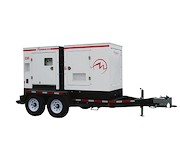 This generator should power multiple units, depending on the unit and the power consumption of each unit. The amount of hours it runs, will depend on the powerload.